Cascina Luisin is a traditional family wine estate in Barbaresco, Piedmont, founded in 1913 by Luigi Minuto (‘Luisin’ means ‘small Luigi’ in dialect). It comprises 7ha of predominantly old vineyards, 50% of which grow Nebbiolo, notably Sori Paolin in Neive, Rabajà and Asili in Barbaresco itself; total production is approx. 30,000 bts per anno. 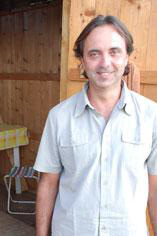 The estate is currently run by Luigi Minuto and his son Roberto; the latter joining in 1995 from viticultural school. Roberto’s second vintage making Barbaresco from this celebrated cru. If sand is what characterises Paolin, and grey, marne clay Rabajà, then limestone is what surely distinguishes Asili. (Indeed, Asili could be said to possess the agility of Paolin with the complexity of Rabajà.) Whatever the similarities, it’s clearly beautifully balanced – the limestone element giving us masses of small, red fruit that have soaked up the hot August sun, rendering them tamarind like, decadent even, and complemented by new Stockinger oak botte.